Pumpkin Cream Sauce pasta made with fresh roasted pumpkin puree marinara, parmesan, vodka, and fresh basil. 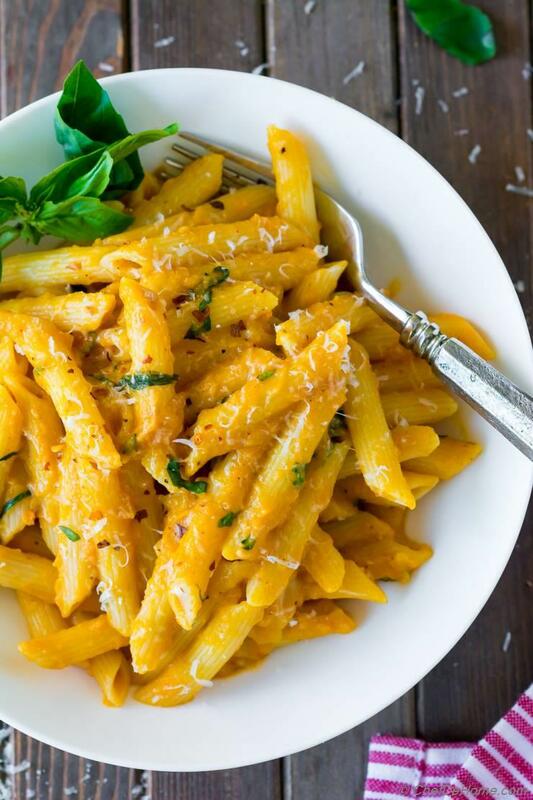 This recipe for Pumpkin Pasta Sauce is my fall inspired take on Penne Alla Vodka with penne pasta coated in fresh roasted Pumpkin Vodka Cream Sauce, parmesan cheese, and fresh basil. My Pumpkin Marinara a.k.a pumpkin pasta sauce is gluten free, and can be vegan. It stays good in refrigerator for up-10 days. You can use it for any recipe which calls for marinara sauce. Just like I used it to make Penne Alla Vodka. You will be amazed how easy it is to serve flavroful pasta for dinner even when you forgot to add marinara in shopping cart! So, let's make some Pumpkin Marinara Penne All Vodka! Pasta with Vodka Cream Sauce, is staple pasta dinner in our home. This recipe was one of the very first I shared on the blog. Almost 6 years ago... It feels like yesterday though. :) Time flies! Today when I was creating this post to share, I felt my old post needs a revival. Poor thing has 6 year old photos when all I knew was cooking. Had no photography skills what so ever! Pumpkin Penne All Vodka, or Pumpkin Vodka Cream Sauce Pasta is inspired from my previous recipe. Pumpkin is delicious creamy vegetarian base. I was thinking to make it to pasta sauce since long. Pumpkin is also a sweet and somewhat neutral base. So, I enhanced the flavor for base Pumpkin Pasta Sauce with lots of herbs, cooked onions and garlic, lemon juice, and honey. I made this pasta sauce with freshly roasted Sugar Pie Pumpkins. Fresh pumpkin gave pasta orange-yellow color. 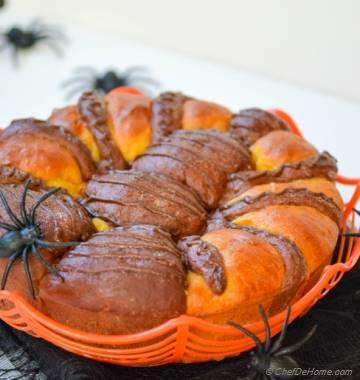 You can even use canned pumpkin puree for this recipe. Or refer my recipe for Roasting Fresh Pumpkin and making Homemade Puree. Later, I changed the plans because really I made this sauce to share Vodka Cream Sauce Pasta. Still, if you are vegan and looking for Vegan Pumpkin Pasta Sauce. I recommend following the base vegan pasta sauce recipe up-to Step-3. (Replace honey with agave.) Then, omit butter and cream from Step-4 to make vegan Penne Vodka Pasta. Or use any favor you like with the base sauce. What do you say? Buy more squash or not? If you have lots of pumpkins at home? I recommend making a big batch of Pumpkin Pasta Sauce. It stays good in refrigerator up-to 10 days or freeze well up-to 3 months. You can make some now and then serve pasta for dinner at moment's notice. Specially during busy holiday season... This will be a BIG time and money saver. Save money, eat healthy homemade, and save time to do extra shopping. Win-win! To make the pumpkin pasta sauce, I start by sauting the onion, garlic with herbs. Then add roasted pumpkin's puree and tomato puree with water and seasonings. And cook until sauce thickens, and absorbs flavors. I add a touch of honey, paprika, lemon juice which compliment the flavor of sweet pumpkin. I call resulting sauce Pumpkin Marinara. It has all of the pumpkin flavor but taste no less than a well made Italian marinara sauce. Please note the color of sauce vary based on kind of pupkin puree used. Canned pumpkin puree has deep orange color. I used fresh puree for this recipe which gives it mild yellow-orange color. Cream and tomatoes also change the color a bit. Pumpkin Marinara can be refigrated for 10 days or frozen for couple of months. Once I have marinara, Penne All Vodka is ready in 15 minutes at anytime. I recommend making sauce over the weekend and serving pasta at moment's notice! To make Penne Alla Vodka, I heat a portion of sauce with butter, add vodka and let alcohol evaporate leaving behind a subtle flavor. 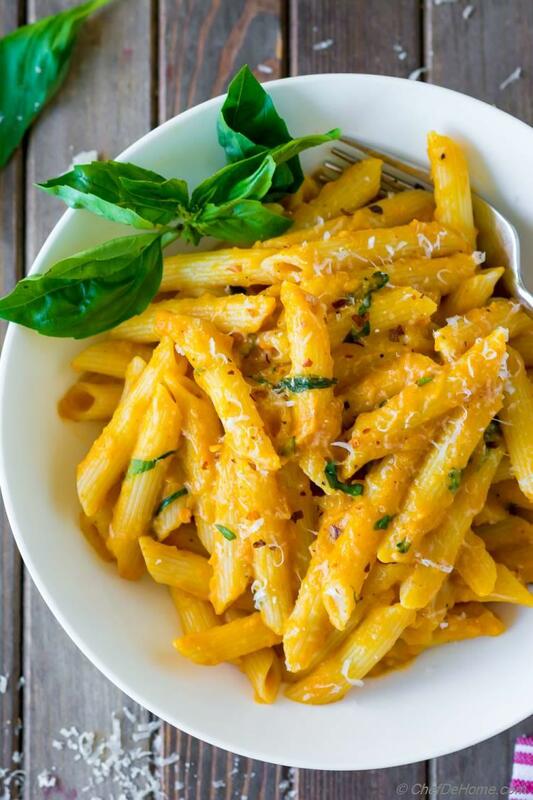 A little hint of cream, grated parsmesan cheese, and fresh basil makes the very best Pumpkin Penne All Vodka in no time! 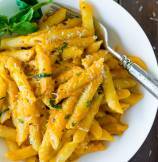 Creamy, silken, cheesy sauce coating penne with fresh basil. Scrumptious! I hope you will enjoy my seasonal take vodka cream sauce pasta a.k.a my pumpkin marinara pasta. 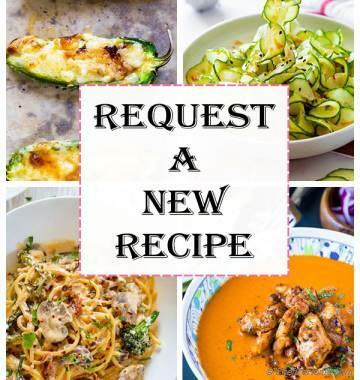 Try recipe this week. Don't forget to make it your own! 1) Keep it vegan by replacing honey. Skip or use subsitutes for cream and cheese. 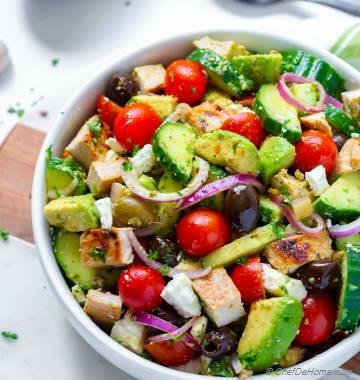 2) Keep it gluten free by using gluten free noodles or veggie zoodles. 3) Make it loaded for hearty meal with mushroom, tofu, or chicken. Total Time 40 minutes Prep Time 15 minutes Cook Time 25 minutes Difficulty Easy Yields 3-4 Cups Pasta Sauce Serves 4 Notes No. of servings depends on serving size. 1. Cook penne pasta in salted water according to package directions. 3. 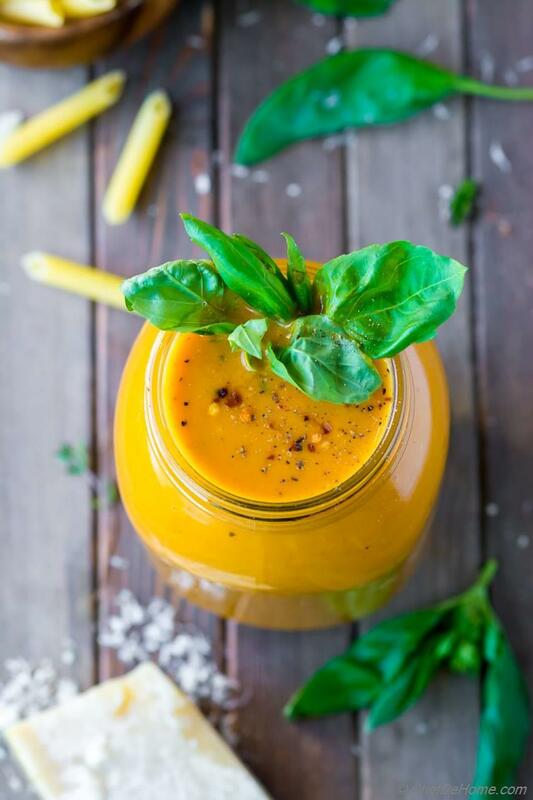 Add roasted pumpkin's puree and tomato puree with 1 cup water (or stock if using) and 1/2 teaspoon salt. Mix well. Add cayenne, honey, lemon juice. Mix well again. Simmer for 10-12 minutes (covered) or until sauce thickens. Taste and adjust salt and black pepper. Transfer sauce to blender, blend until smooth. Store it in air-tight container in refrigerator if not using immediately. At this stage Pumpkin Pasta Sauce is without alcohol and also vegan. 4. In wide saute pan, melt 2 tablespoon of butter. Add pasta sauce prepared in step-3. Cook sauce with butter for a minute. Top with vodka. Mix and boil sauce until alcohol cooks off (3-4 minutes). Add heavy cream with 1/4 cup or 1/2 cup stock (or water) to adjust the consistency of sauce as per your liking. Cook for 3-4 minutes or until sauce is glossy. Melt remaining butter into sauce. Taste and adjust salt and black pepper. (don't forget to taste and adjust seasoning) Take sauce off heat. 5. Add cooked drained penne into the pasta sauce, top with half of grated Parmesan cheese and half of the basil (chopped). Gently fold pasta into the sauce. Reserve some pasta water if serving pasta later to adjust the consistency of sauce. 6. Serve immediately in pasta bowls topped with remaining cheese and fresh basil. Enjoy! Pasta, penne and vodka all in one title. Yep, I’m sold. Really though, this looks phenomenal! Cannot wait to try! Karly, thanks! Love your sweet feedback! This pasta came out so delicious. My kids devoured it. Pumpkin to rescue for dinner today. :) Thanks for recipe. Aditya, I'm glad your family enjoyed. Thanks for sharing your experience with us. 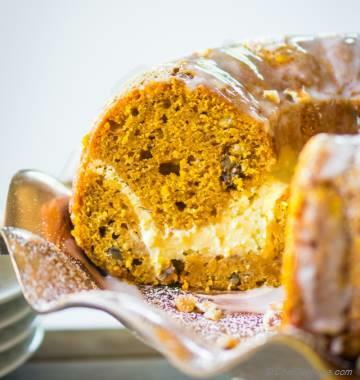 I have some pumpkin puree in the fridge that I've been dying to use in a new way...this recipe will be perfect! Can't wait to give it a try...looks delicious!! Thanks Sarah. I hope you enjoy when you try. I soooo need to make this...like right now! I can tell by looking at these ingredients that this is gonna be a winner. Thanks for sharing! Thanks for such sweet words Traci! It is indeed very delicious pasta. I hope you get chance to try it. Thanks for stopping by. This looks pretty awesome. Pumpkin can mix into so many things. Thanks Ben. 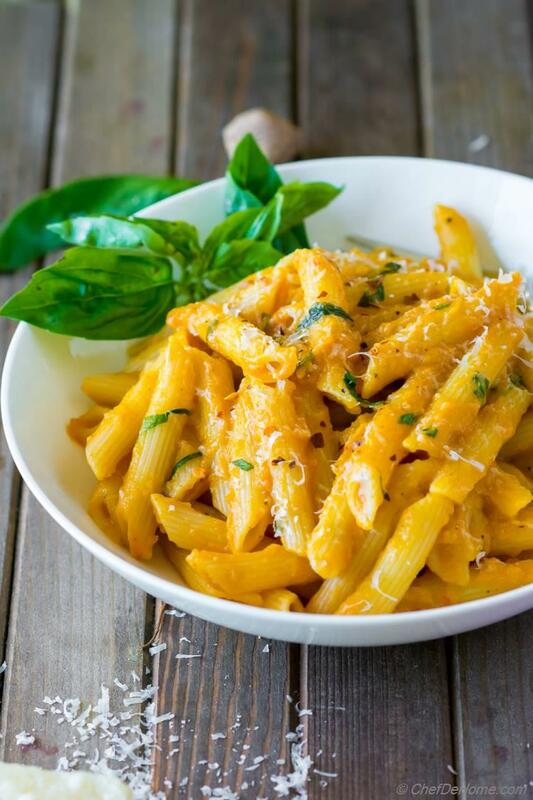 Indeed pumpkin makes delicious pasta sauce which can be used to add twist to many pasta recipes. I'm glad you second my opinion. Love this idea, can't wait to give it a try! Thanks Amy! I hope you get chance to try this pasta soon! I'm sure this taste very delicious. 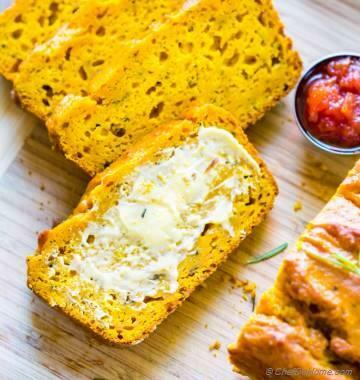 Can I use butternut squash or sweet potato? Thanks, Neeli, for sweet words. You can use butternut squash puree. I have not tried this with sweet potato but I think it should be fine. Flavor of pasta will differ slightly due to distinct taste of these two. I hope it helps. OMG! Love the look of this pasta. Vodka Cream Sauce is just brilliant!